The RSCTA is a nationwide group offering encouragement and support to those training or competing in any canine activity. We have leagues and awards to celebrate achievements of our Rough & Smooth Collies, and an active facebook page for discussion and advice. There are also training opportunities, although these are limited, due to the spread of members throughout the country. Please contact us for more information. Final results for ALL 2018 leagues, and news of any significant achievements, can be found on the pages for each activity. 2019 results (all leagues) to Jean please. ALL leagues start on Jan 1st. Don't forget there is a 2 month deadline for sending points so the leagues remain valid (4 months to end of April). The 2019 AGM was held on 3rd March. League rosettes were awarded, details of these and plans for 2019 will be in the forthcoming Newsletter. Don't forget to renew your membership. Contact details for all committee can be found on the 'About the RSCTA' page. This will be held on Saturday 28th September 2019. It will be held at Prospect Village Hall on the edge of Cannock Chase in Staffordshire. Abby is organising it for us, and an informal get together with activties and games is planned. Do put this date in your diaries - more details later. The top 4 logos from the vote are being made into a more formal format ready for a final members' vote. Watch this space. The Fun Day was enjoyed by those who went, despite the unusually hot weather! Amongst the activities, the opportunity to try hoopers was particularly appreciated. 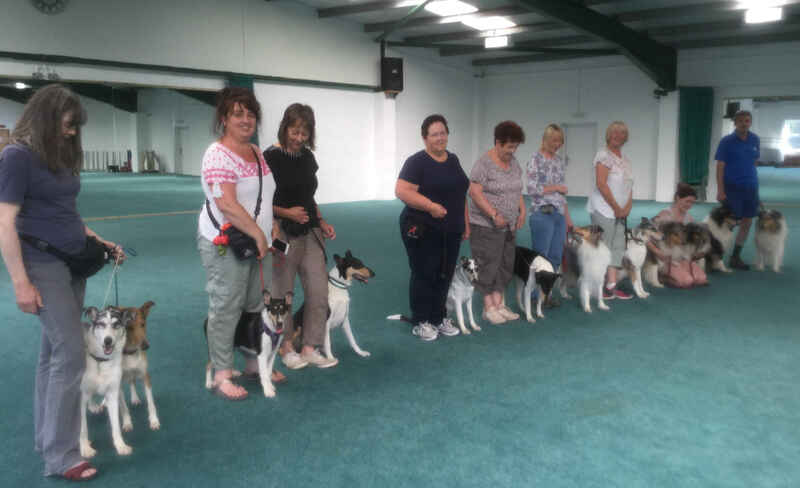 The photos show some of those there, and also the winners of the team heelwork competition which gave members and their Collies the chance to see what being in an obreedience team was like. Thank you very much indeed to Pat for organising this event so well. 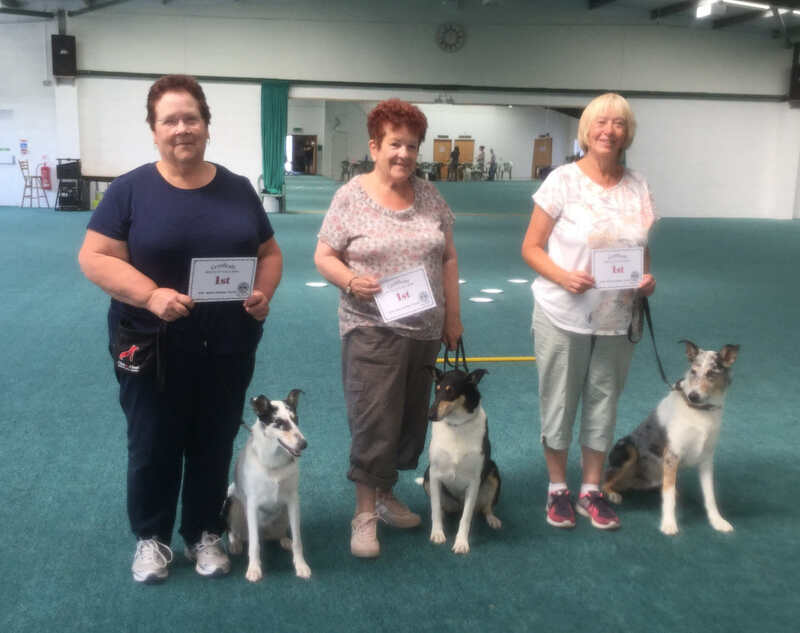 WELL DONE SMOOTH COLLIE OBREEDIENCE TEAM ! Congratulations!! 2nd place at Crufts 2018!! MEMBERSHIP & LEAGUES: Don't forget to renew your membership and include your league renewals too (see Membership page). Then start sending ALL your league results to Jean asap. Good luck for 2018! If you have not had a copy e-mailed to you please contact Paula to check she has the correct e-address. Thanks to all who contributed. On the road to collecting points for Crufts 2018, The Smooth Collie OBREEDIENCE team. The competition involves all team members doing a synchronised heelwork pattern (hardest part of all is getting the handlers to be coordinated with each other ! ), and then there are four set exercises with one team member performing each - a send to bed, a 'stop the dog' / play with your dog, a formal retrieve and a scent discrimination exercise with the dog retrieving its own article out of a range of other articles. 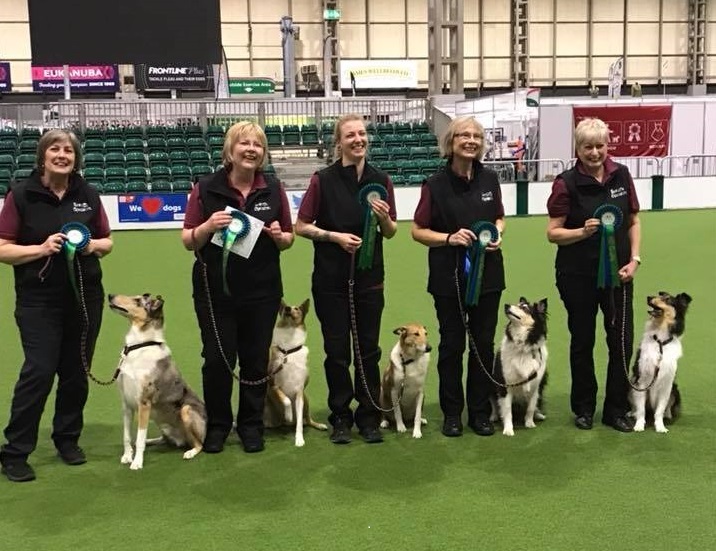 A team can have up to six members.The format of the competition is that teams participate in a number of (geographically scattered) qualifiers over the year and the teams with the highest accumulated score qualify for the final at Crufts 2018. 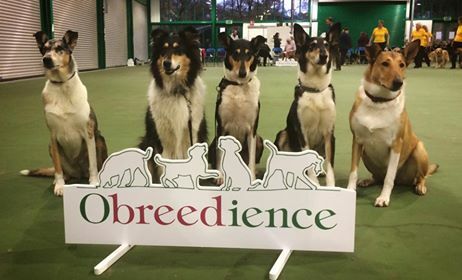 Photo below shows the Smooth Collie Obreedience team at Crufts 2015. If you are not getting your mailings from the RSCTA please remember that many e-mail systems treat mail from new/group sources as 'spam' unless instructed otherwise by the user. Such mail is then directed to a 'junk' mailbox to be deleted within a couple of weeks. Please therefore look out for this problem until you know that RSCTA mail is being correctly routed to your main 'inbox'. If you feel that mail is still not reaching you then please contact Paula. .